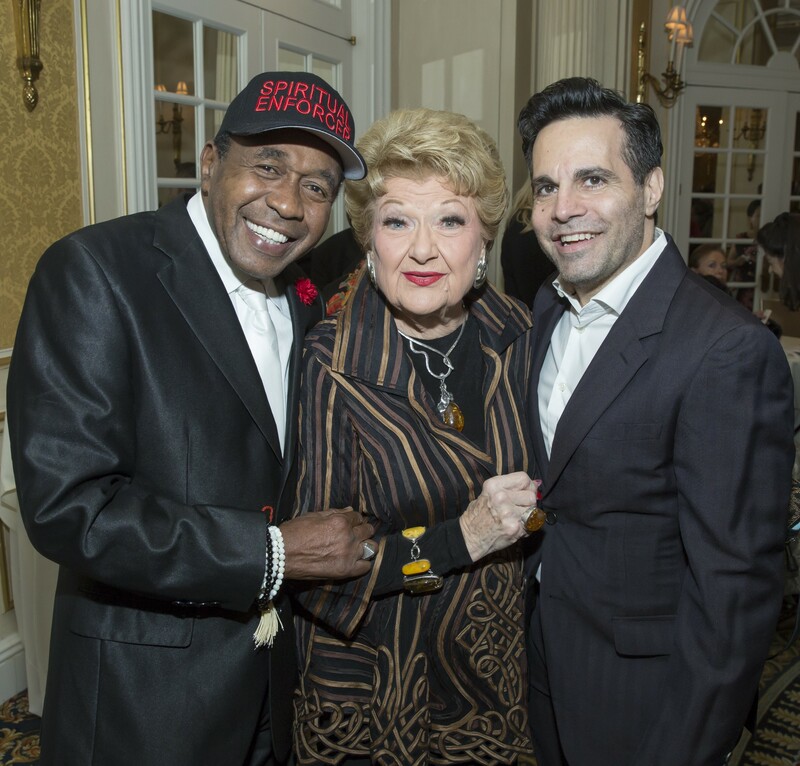 The Community Church of New York, located at 40 East 35th Street in Murray Hill, New York was the venue for the Opera Index annual membership celebration on Wednesday, November 9th. It was a dreary drizzly night but as in the past, the room was crowded. Jane Shaulis, who is a mezzo soprano at the Metropolitan Opera, is the new President of Opera Index. She spoke of scholarships that were divided among 16 singers. The original 300 who applied were all given encouragement to return if not chosen this time. 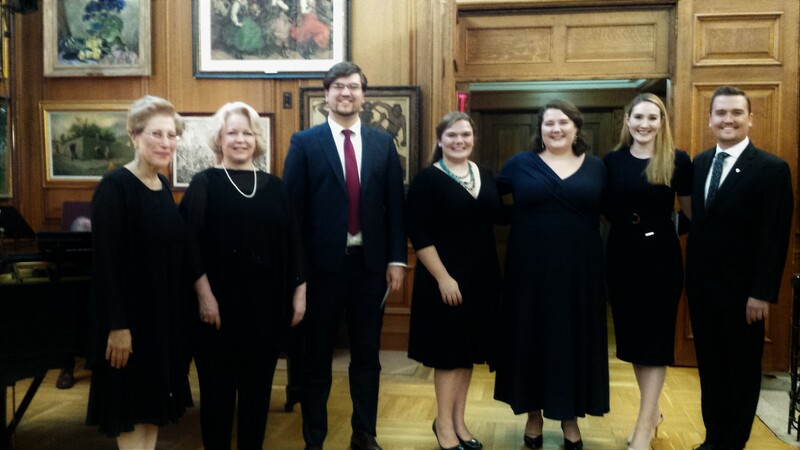 This evening five of those singers were heard accompanied by gifted accompanist Michael Fennelly. Andres Moreno Garcia, Mexican tenor sang “De miei bollenti spiriti” from La Traviata by Giuseppe Verdi. Mr. Garcia’s voice has a mellifluous and pleasing quality. His encore was the passionate Spanish Zarzuela song “No puede ser” which he sang with abandon. It is one of Placido Domingo’s most impassioned recordings. American tenor Alexander McKissick followed with “Torna ai felici di” from Puccini’s seminal work Le Villi. His vibrant voice has much sheen. His encore was” You and the night and the music”(Arthur Schwartz-Howard Dietz) nicely done with good soft contrast to his strong top. Mario Lanza’s impassioned but somewhat bombastic “pop” version of this song is recommended listening. SeokJung Baek, from South Korea sang “Avant de quitter ces lieux” from Gounod’s Faust. His robust lyric baritone traveled the various vocal highways smoothly and his final note was held and swelled with satisfying results.This aria is always a big moment in the opera. Baek’s encore number was “L’alba separa dalla luce l’ombra” by Francesco Paolo Tosti (Dawn banishes the night). This song was recorded in 1917 by the immortal tenor Enrico Caruso and is one of his greatest recordings. Mr. Baek hit the high note with great abandon and gave us all a visceral thrill. One could see, hear and feel dawn triumphant, banishing the darkness! Cesar Delgado, Mexican tenor sang “La donna e mobile” from Verdi’s Rigoletto, with elan and with a resounding high C preceded by a fine cadenza. His vocal projection is in the style of legendary Spanish tenor Miguel Fleta with some lovely diminuendos and strong fortissimo’s. His encore was “Yours is my Heart Alone,” from The Land of Smiles by Franz Lehar sung in flawless German. 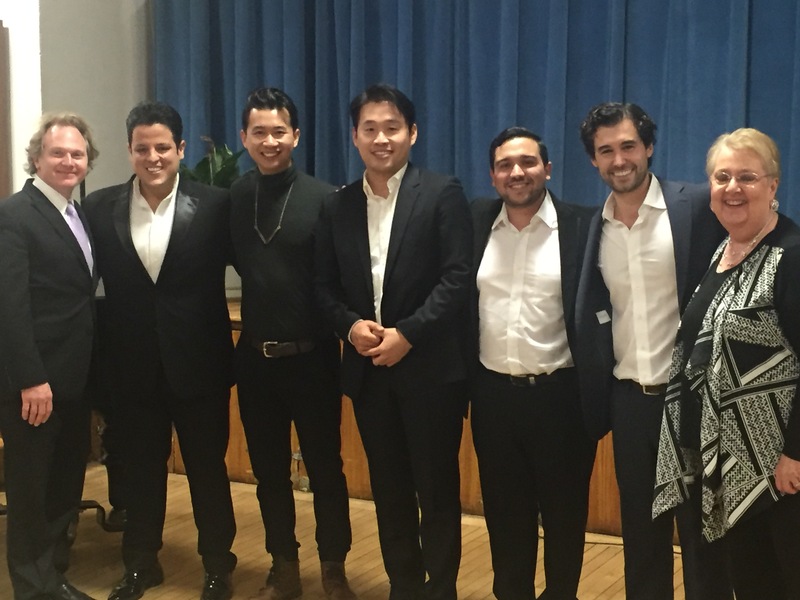 Brian Vu used his essentially lyric baritone well in “Largo al factotum” from Rossini’s Barber of Seville. Vu did the patter and declamatory portion with dexterity and made it great fun! Vu’s encore was “Johanna” from Sweeney Todd and was well sung and acted! Jane Shaulis then announced the finale which was called “Three Tenors and Two Baritones” all singing a “fun”competitive “O Sole Mio” and ending fortissimo to much delight and applause. In the audience were legendary singers, Met opera mezzo Rosalind Elias, dramatic soprano Elinor Ross, soubrette soprano and TV opera pioneer Elaine Malbin, Janet Stovin and composer Philip Hagemann, Vice Presidents, Murray Rosenthal treasurer, Executive Director Joseph Gasperec, Board members John Metcalfe, Jessie Walker, Mark Steiner and Steve De Maio, President of the Gerda Lissner Foundation. 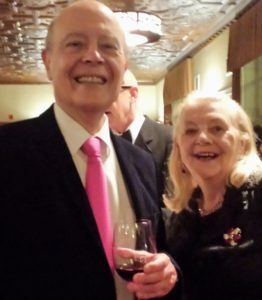 Brooklyn’s Ken Benson, opera manager and radio personality, the famed Brooklyn born “world’s greatest opera fan” and subject of a recent documentary, Lois Kirshenbaum, who although legally blind, never stopped her from attending every Met opera performance for decades. Maestro Stephen Phebus and wife Linda Howes, David and Barbara Meister-Bender from Career Bridges, Brooklyn’s Bill Ronayne from The Mario Lanza Society, opera lecturer and educator, Lou Barrella, Cavaliere-poet Edwardo Jackson, the vibrant chef-reviewer Meche Kroop and new members Bob Ohlerking and friend Christopher LiGreci from Park Slope, Brooklyn were in attendance. A sumptuous dinner plus coffee and desserts was enjoyed by all. The offerings by these young and promising opera singers was feast enough. It was no longer raining when we left, but we were literally “Singing in the Rain” in the puddles. All the sunshine we needed was at the church from food, friends and frolic to fresh young voices of the future! The cocktail hour included many items to be sold at a silent auction. 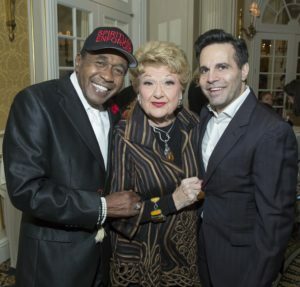 We spotted Broadway actors dancer & singer Ben Vereen, actress singer Christine Ebersole and Broadway and TV’s Mario Cantone, cabaret singer Marilyn Maye, PBS’s Midge Woolsey, Advisory Board member and her husband economist Dr. Jerry Stolt. There was also a bevy of famed and familiar faces from the triple blend from the movers and shakers of opera, entertainment and fashion. Met tenor and fellow Sicilian Anthony Laciura with his wife Joelle and New York City Opera and Met tenor Richard Leech, both active with the Martina Arroyo Foundation. Once in the dining area, the great lady herself, Martina Arroyo, looking radiant in gold and silver, welcomed the guests and spoke eloquently about the great pride she has in furthering the careers of these incredibly talented young people. Jeanine Tesori, composer and musical arranger won a Tony award for Fun Home. She spoke passionately about composing in a man’s field without it becoming a mine field and the importance of being dedicated and never giving up. The third honoree was Broadway actress and singer Christine Ebersole, who told the audience that nobody works harder than these young opera singers. With conductor Steven Crawford at the piano, the music began with the third act of Puccini’s La Boheme. Yunnie Park was Mimi, her radiant soprano caressing the ear and her poignant voice the soul, as she sang “Addio, Senza rancor.” Her distraught Rodolfo, Dangelo Diaz whose ardent tenor flooded the house “Addio sogni d’amor” in their duet was a perfect blend of singing and acting. Seok Jong Baek was the exasperated Marcello, his lyric baritone engaging in banter and insult with Musetta and always pleasing to hear. Musetta, Holly Cameron, moderated her shimmering soprano voice, never strident, but strong in her arguments with Marcello. 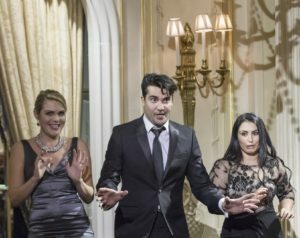 Both couples agree to stay together, until spring. Beautiful break up and make up ensemble singing! Dinner was served followed by a “live” auction with rapid banter auctioneer Warren Adler selling off some wonderful items including a week in Paris and a week in London! Excerpts from Johann Strauss II’s Die Fledermaus followed. Hongni Wu sang a witty “Chacun a son gout” from Act Two. Her rich, dark mezzo plumbed the plummy depths of this aria and it was a tour de force triumph just as it was in last July’s Die Fledermaus at Prelude to Performance. 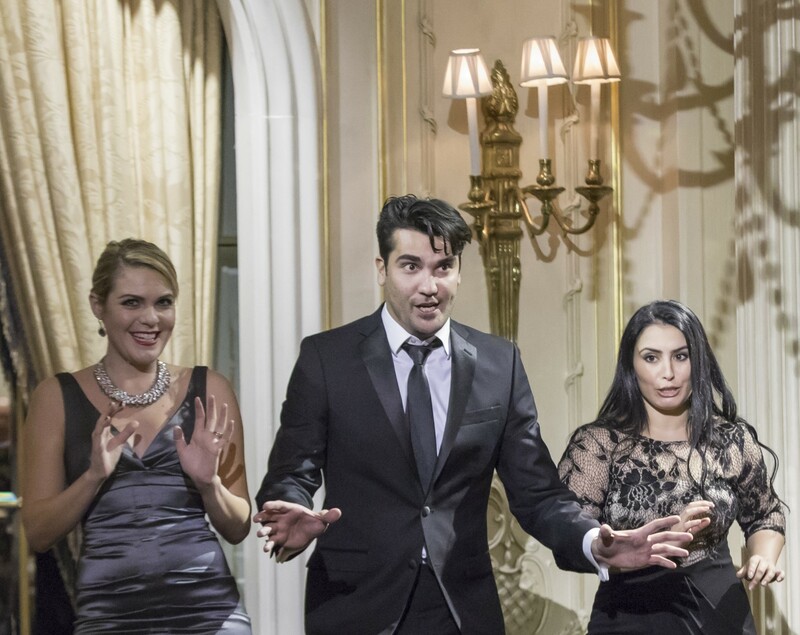 The Act One scene trio followed with rising soprano star Maria Natale as a sparkling, radiant voiced Rosalinde, coloratura soprano Shana Grossman repeating her savory saucy Adele and matinee idol tenor Jonathan Tetelman as Eisenstein. He was also in last July’s excellent production of Die Fledermaus and his change from baritone to tenor repertory is coming along very well indeed! Maestro Stephen Crawford who conducted the Prelude to Performanceorchestra last July was the superb accompanist. 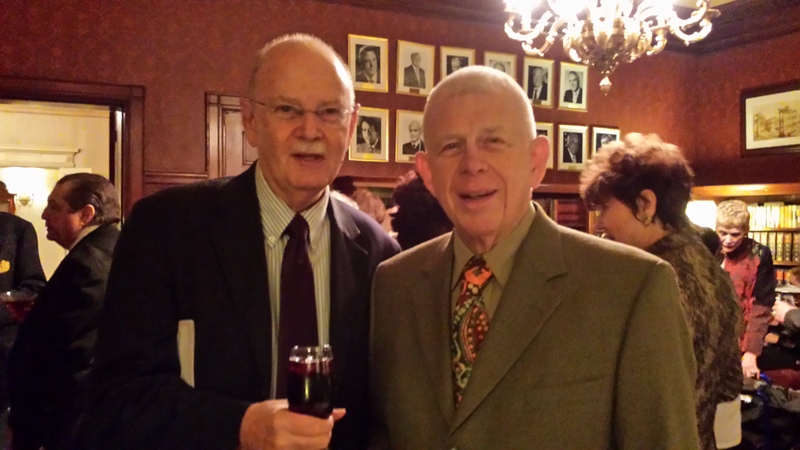 Opera Index treasurer Murray Rosenthal presented the award to Broadway great Christine Ebersole. Christine Ebersole sang a Harold Arlen ballad from Bloomer Girl “Right as the Rain” without a mike in a lovely, clear expansive soprano that wrapped itself around the ear and heart of us all, brava! After dessert and closing remarks by Terrance McKnight, Grammy award winning musician and saxophonist Paquito D’Rivera, accompanied by Daniel Freiberg played a sensual “Libertango” by Astor Piazzolla followed by a jazzed up “Quando me’n Vo” by Puccini and some jazz improv in which could be heard The Donkey in the Grand Canyon Suite. Special thanks to honorary Gala chairs, Donna and Richard Esteves and Andrew Martin-Weber, all who were so diligent on behalf of this exciting evening. 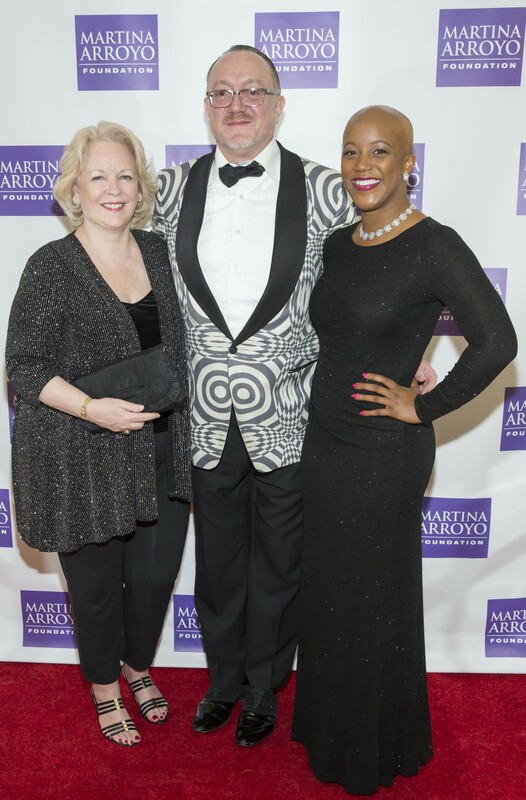 We thank Martina Arroyo, Kennedy Center Awardee, legendary Metropolitan Opera soprano and musical pioneer and beacon for future stars. Martina’s beloved Dad Demetrio worked as an engineer at the Brooklyn Navy Yard to pay for her musical education. Martina fondly recalls the baseball games and the hot dogs from Ebbets Field that he brought her as a reward for her efforts. The Board of Directors gave special thanks on the beautifully printed program to Martina Arroyo, Norena Barbella, Marcia Green and Helen Chang. Our host at our table was Advisory Board Member Stephen De Maio President of the Gerda Lissner Foundation, with board members Karl Michaelis, Vice President Michael Fornabaio, patrons Barbara Ann Testa and Gloria Gari from the Giulio Gari Foundation and pioneer Maestro Eve Queler from Opera Orchestra of New York who also graced our table. It was fun to meet with honorary gala co-chair and Vice President Andrew Martin-Weber whose big league bravos were a joy to hear. I dubbed him the “Caruso of bravoers”! As we left homeward bound we chatted with famed radio personality WQXR Nimet Habachy with Mr. Maisel, past awardee Michele Angelini internationally acclaimed Met Opera tenor and Martina Arroyo awardee told us of his family roots in Park Slope, Brooklyn. All of this glitter and glory is for giving the fresh young talented singers a “push” toward attaining their goals and thus ensuring this beauty parched planet, a future with opera and music and the joys therein. Brava Martina Arroyo and thank you and the Martina Arroyo Foundation for letting in the sunlight of enlightenment and hope! The Kosciuszko Founation was the venue for The Gerda Lissner Foundation 2016 Lieder/Song Vocal Competition Winners Concert on the evening of Friday, November 4th at 15 East 65th Street in New York City. Stephen De Maio, President of the Gerda Lissner Foundation introduced his board members: Michael Fornabaio, Vice President and Treasurer, the effervescent Cornelia Beigel, Secretary, Karl Michaelis, Trustee and Barbara Ann Testa Trustee. Mr. De Maio singled out many guests in the audience including Jane Shaulis, Met mezzo and President of Opera Index, Joseph Gasperec, Executive Director, Jane Marsh, soprano and lecturer, Scott Carlton from the Wagner Society, Gloria Gari from the Giulio Gari Foundation, Brian Hunter from the Musicians Club of New York, famed illustrator Gregory Downer and Alfred and Christine Palladino from the Columbus Citizens Foundation. 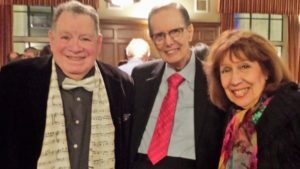 Hosting this special event was Midge Woolsey, whose speaking voice was a familiar presence on WQXR radio for 20 years and whose charm and persona warmed the heart and hearth on Channel 13 as well. When Steve De Maio introduced Ms. Woolsey and her lengthy credentials, she said it was easy to leave all that, having met and married her husband, economist Dr. Jerry Stolt. The tie in? LOVE as found in the song cycle of the evening. Cole Porter said it all in “Easy to love, all others above!” True love has its strong points but love unfulfilled is another story. Midge Woolsey answered that rhetorical question, “If not she, who would she be?” The answer – Arlene Shrut! our splendid accompanist because making heavenly music is a joyous thing to do. The evening began with Cody Quattlebaum singing “Der Atlas” by Franz Schubert. Mr. Quattlebaum’s dark bass- baritone plumbed the depth of each word reaching levels of fury and dismay and one could hear in his cavernous sound, Amonasro and Wotan. Love is angst and this case the weight of the world was on his shoulders. Atlas did not shrug but he did carry on quite a bit! Kelsey Lauritano sang “Var det en Drom?” (Once I was your hearts true love) by Jean Sibelius. Her shimmering mezzo was like a lonely fjord, solitary and saddened. Sibelius, a loner, shared his feelings in this brief but telling piece. Ms. Lauritano ably created the mood. Amanda L. Bottoms sang “Ich bin der Welt abhanden gekommen” by Gustav Mahler. Mahler’s wife Alma gave him a very difficult time with her liaisons but he loved her deeply despite all. Who better than he to write of love’s pain? Ms. Bottoms has a warm rich powerful mezzo and I thought Marian Anderson redux. She seemed to be a force of nature, a majestic sound and presence. A future Amneris? Heather Stebbins sang” Unbewegte laue Luft” by Johannes Brahms, her vibrant soprano shimmering like a cascading brook. Ms. Stebbins has a strong affinity toward the Wagnerian and that special refreshing sound. The real deal! Miles Mykkanen sang “Nous avons fait la nuit” by Francis Poulenc with good breath control, sweetness and a nice dark edge to his tenor voice making love’s pining pleasant to hear. Felicia Moore sang “La Chevelure” from Chanson’s De Bilitis by Claude Debussy. “I was stroking your hair but it was my own.” Ms. Moore’s soprano has sensuality, vitality, some good floated tones and a hint of Verdi down the road. Part two of this somewhat bumpy road of love began with another “dark” voice, Anthony Schneider, bass. “Svarta Rosor” (Black Roses) by Jean Sibelius. In this brief but distraught song, Anthony Schneider revealed a cavernous sound and the music and feel of the piece evoked The Flying Dutchman in its angst and pain. Samantha Hankey used her haunting mezzo to capture the essence of Franz Liszt in “Der Du von dem Himmel bist.” Her dark hued, even and powerful voice with its well placed and paced vowels indicated that her training at Julliard paid big dividends for her! Dennis Chmelensky sang “Der Neugierige” by Franz Schubert in a fervent baritone. He was relaxed and focused despite a long train ride from Philadelphia. He has a plangent and strong focus and evoked memories of the charming and youthful Met baritone Theodor Uppman. Angela Vallone, who recently sang in Cavallis’ “La Callisto” sang “Flickan kom ifran sin alsklings mote” by Jean Sibelius. Ms. Vallone’s vocal placement had that special mask sound and her vocal cascades and ascensions were thrilling giving one goosebumps. Ms. Vallone’s unique and pleasing timbre will make her a specialist of rare operas as well as standard repertory. Sibelius music such as “Valse triste” can evoke great sadness and loneliness. Ms. Vallone truly tore at the heartstrings. Lastly Erik Van Heyningen sang “Der Doppelganger” by Franz Schubert with youthful zest and charm. His dark edged bass baritone has a natural courageous and peerless sound. His upper and lower registers were effortless and his projection impressive. The reception afterwards allowed one and all to meet and greet the singers and friends.The message of love and its consequences is an old one! The agony and the ecstasy has not changed. 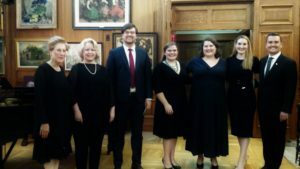 We thank the Gerda Lissner Foundation in collaboration with the Liederkranz Foundation for this lovely evening of lieder, showing love’s ups and downs. 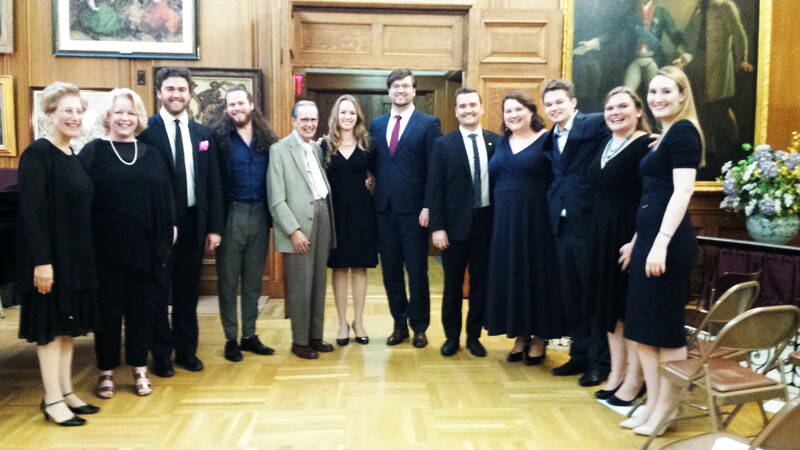 The delicious reception afterward was presented by Philipp Haberbauer, General Manager of The Liederkranz Foundation. 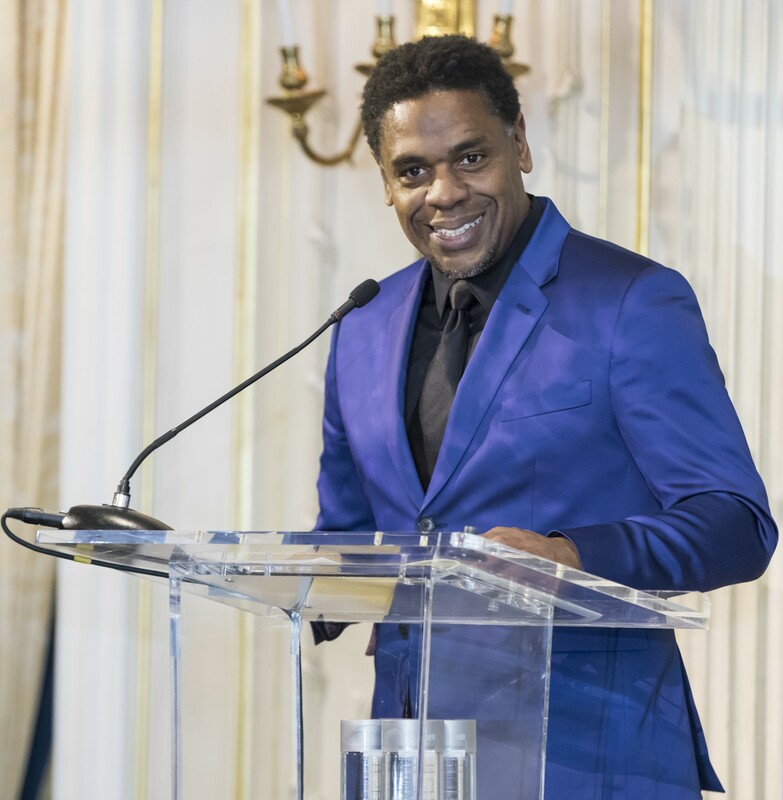 On the warm, breezy night of Thursday, November 3rd, Glenn Morton, Artistic Director of Classic Lyric Arts greeted the enthusiastic audience who gathered in the elegant townhouse that is the Kosciuszko Foundation located at 15 East 65th Street in New York City. The scholarships involve the art of French and Italian singing and studies in both countries. Glenn Morton, Artistic Director of Classic Lyric Arts with singers & pianists. 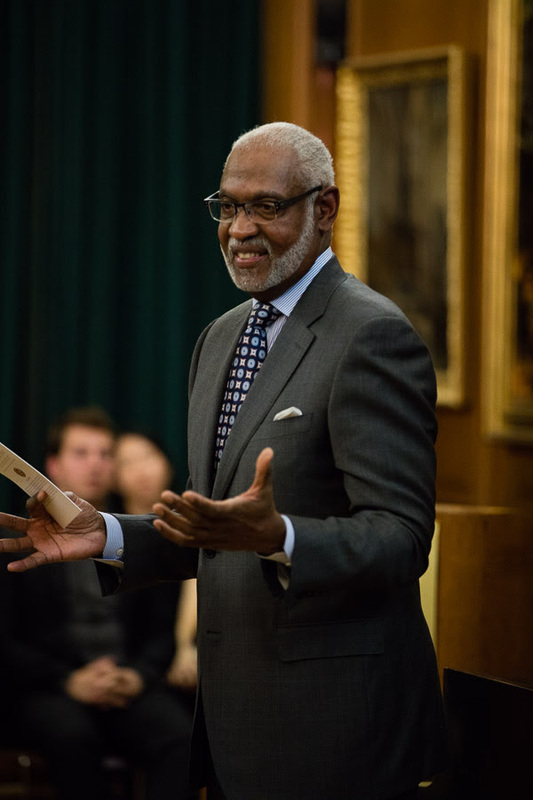 Mr. Morton spoke eloquently of the need for music and those magical moments frozen in time of hearing and viewing great singers as “a movable feast” like Hemingway or like Wordsworth’s “I wandered lonely as a cloud”(Daffodils), that live forever in heart and memory. This is the fifth year of these soirees and the selections offered us a bouquet of cherished and unforgettable moments. 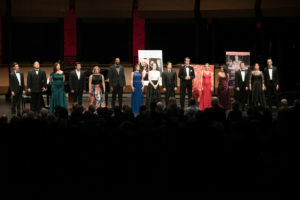 The first was “Alla bella Despinetta” from Mozart’s Cosi fan tutte sung in perfect ensemble by soprano Angela Joy Lamb as Fiordiligi, mezzo Maria Miller as Dorabella, soprano Michelle Geffner as Despina, John Haney, tenor as Ferrando, Xiaoxiao Cheng, baritone as Guglielmo and baritone, Andrew Jurden as Don Alfonso accompanied by Brianna Han on the piano.The men appear in disguise, each in an attempt to seduce the others fiancee. The witty libretto by Lorenzo Da Ponte was brought to the fore by the youthful, comedic flair and vocal expertise of the singers. It was a perfect blend. Soubrette mezzo Zoey Preston regaled us with “A quel diner je viens de faire” from Offenbach’s Le Perichole. Sung with a saucy and tipsy mein, Ms. Preston’s sweet and flexible mezzo caressed the ear and her humor the funny bone! Michael Stewart was the able accompanist. Labbra di foco, from Verdi’s late masterpiece Falstaff followed. Soprano Hee So Son was Nannetta and tenor Joey Haney as her lover Fenton. Ms. Son’s vibrant lyric flights were a perfect blend for Joey Haney’s sweet and ardent tenor and their few stolen moments together were rhapsodic. Michael Sheetz was their fleet fingered accompanist. Vera Kremers sang “La paix du cloitre” from Gismonda by Fevrier in a cavernous mezzo at once gripping and sensuous. One heard a Wagnerian soprano in the mix of her voluptuous and generous outpourings. Gismonda, widow, has entered a convent but without conventional (pun) wisdom-still has desire. Michael Stewart, the pianist brought out the conflict of her sacred-profane quandary. “Un di se ben rammentomi” (Rigoletto Quartet) by Verdi was given a stellar performance by tenor Fanyong Du as the Duke singing with ringing tones, pleasing quality and fearless elan, soprano Elizabeth Perez was a flawless Gilda with a Galli-Curci high note at the finale but tapered beautifully, robust baritone Xiaoxiao Cheng a strong Rigoletto and mezzo, Maria Miller, a sultry alluring Maddalena. Michael Sheetz agility on the piano was like hearing a full orchestra! 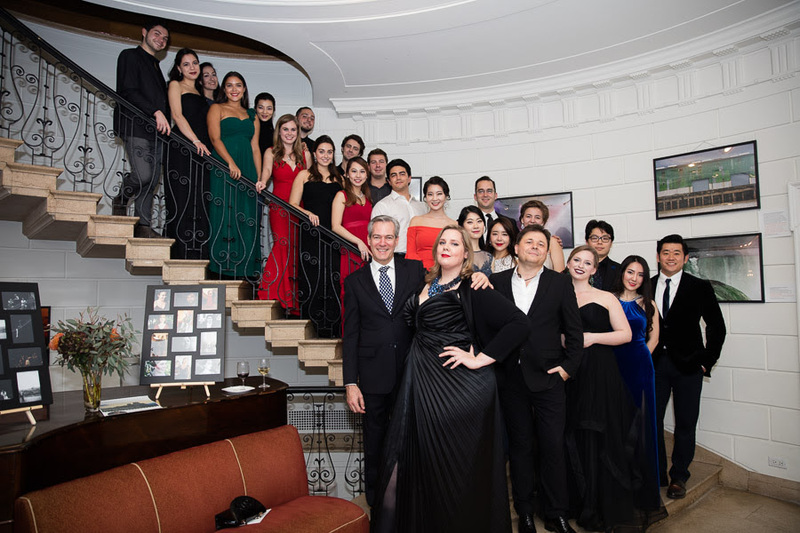 Massenet’s Manon “N’est-ce plus ma main” followed featuring as guest performer, famed French tenor Stephane Senechal, who is co-artistic director of L’ Art du Chant Francais and seductive soprano Mikaela Bennett. Chevalier Des Grieux is now a priest and Manon wants to lure him back from a man of the cloth to one under the sheets. The ensuing duet is loaded with passionate outbursts and emotion and Des Grieux cannot resist loving Manon once again. Monsieur Senechal has a tenor voice of steel and grit coupled with beauty and grace and Ms. Bennett matched him with her soaring and beguiling soprano. This was a duet of searing intensity sung by two performers in their prime, resulting in moments to remember forever. Michael Stewart’s powerhouse accompaniment was vital! In the MGM film Maytime 1935 (Jeanette MacDonald & Nelson Eddy) Miss MacDonald is heard singing “Les filles de Cadix” by Delibes for Emperor Louis Napoleon. It was with great pleasure to relive that moment hearing it sung by Vivian Yau. Michael Stewart accompanied her to the sprightly bolero rhythm. Ms. Yao’s vibrant soprano with its lyrical insouciance and coloratura agility was a fine showcase for this rare gem! 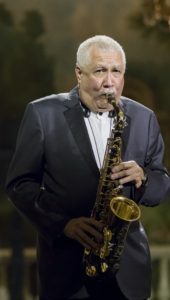 Glenn Morton, who is planning a full concert to celebrate the centennial of composer Paolo Tosti, introduced special guest Donata D’Annunzio Lombardi related to Gabriele D’Annunzio, the great Italian poet. She sang a touching Tosti song “Vorrei morire”. (“I would want to die in springtime when the air is warm and the sky serene, when the earth is covered with flowers, the swallows build their nests and with the dying day”). 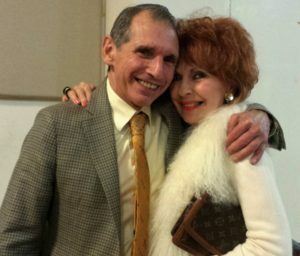 Singer Donata D’Annunzio Lombardi at CLA La Lingua della Lirica & CLA Artistic Director/pianist Glenn Morton. Ms. Lombardi sang the song with fervor, wistfulness, sublime pianissimo and beautiful melancholy. Giuseppe De Stefano and Luciano Pavarotti recorded this song and the immortal tenor Enrico Caruso recorded many Tosti songs among them “A Vuchella” in 1919. Glenn Morton accompanied her with tenderness and veneration. Ms. D’Annunzio Lombardi is a master class teacher at CLA La Lingua della Lirica. The final offering was “Bevo al tuo fresco sorriso” from Puccini’s bittersweet operetta La Rondine. 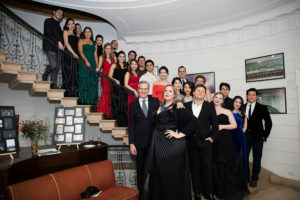 It featured sparkling soprano Yeon Jung Lee as Magda, Elizabeth Perez, saucy soprano as Lisette, Sungwook Kim tenor, a robust Ruggero and lyric tenor John Haney as a sentimental Prunier. 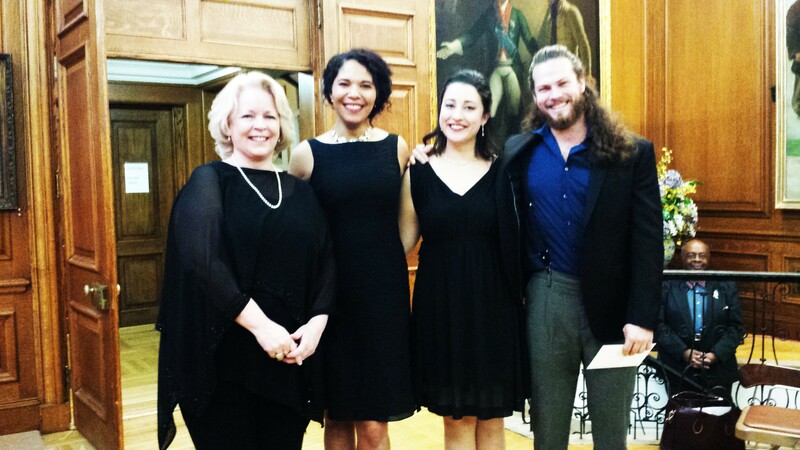 All sang in flawless ensemble brilliantly accompanied by Laetitia Ruccolo, pianist and conducted by Michael Sheetz and all were participants of Classic Lyric Arts in Italy 2016. John Hunter, Vice President & Board Chairman of Classic Lyric Arts. Board member John Hunter was there with his wife Dolores and gave a talk “from a parents perspective” on the joys of parenting a child with musical talent and the importance of mentoring and exposure to ensure success. Thank you Glenn Morton and Classic Lyric Arts and bravo to all! 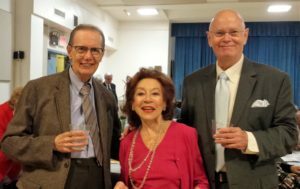 On the evening of Friday, October 28th, The Columbus Citizens Foundation located at 8 East 69th Street was the venue for Opera Night Live! hosted by Stephen De Maio with a special presentation by Lou Barrella. These fabulous evenings were begun by the late Dr. Frank Celenzia. 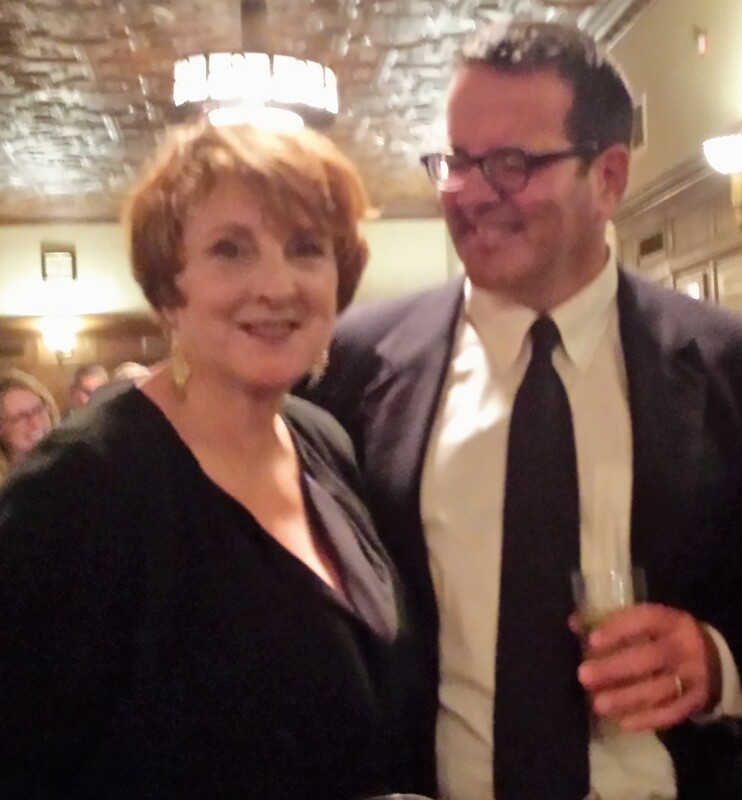 The torch has been passed to Stephen De Maio, Gerda Lissner President, who has brilliantly hosted these special evenings of opera dinners for the last several years. 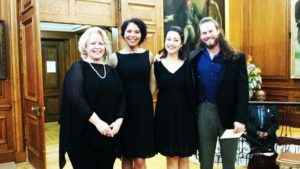 At the concert were three young promising singers: Maria Natale soprano, Fanyong Du tenor and Matthew Ciufitelli baritone, all accompanied by talented pianist and vocal coach Mary Pinto. Mr. Ciufitelli was recently featured in The NY Post because he was hired by Mick Jagger to be a temporary “back up” singer. Ciufitelli sang “Bella Siccome un Angelo” from Don Pasquale by Donizetti with a mellow and expressive baritone that easily negotiated the Bel Canto style of florid and heartfelt singing. Soprano Maria Natale, fresh with California sunshine, in a stunning red dress, sang “Ah, fors e lui” and Sempre libera from La Traviata by Giuseppe Verdi. Ms. Natale is the possessor of a radiant soprano voice and sailed through the pyrotechnics of this showpiece aria nailing the high note with dazzling ease! Fanyong Du tenor, was a promising ice skater in China. He was told to switch careers and sing after a judge chanced to hear him. This evening Mr. Du sang “Je crois entendre” from Bizet’s The Pearl Fishers. A voice lyric but penetrating with a silvery quality, beautiful legato and fine breath control. His tapered notes were magical. The operatic portion over, Mr. De Maio requested “lighter” fare. 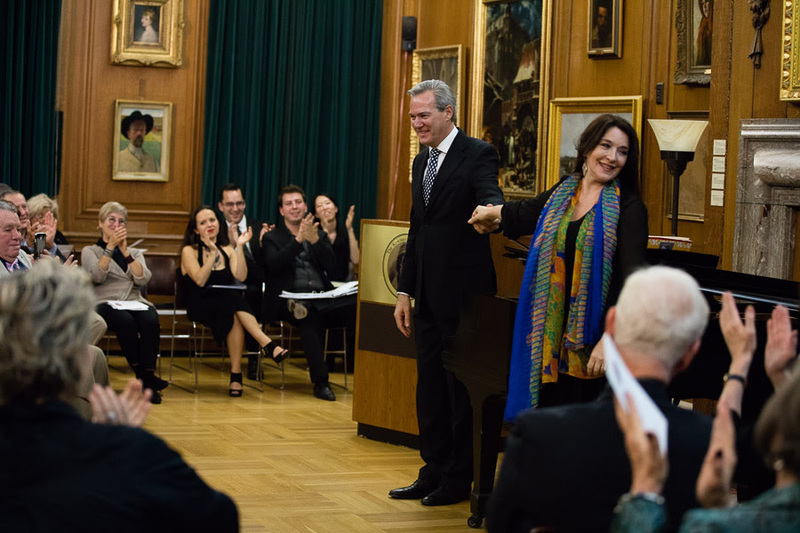 Matthew Ciufitelli and Maria Natale sang a touching “If I loved you” from Rogers and Hammerstein’s Carousel and the charming and witty “Watch song” from Johann Strauss Die Fledermaus with Ciufitelli beguiling the Hungarian princess with his wrist watch. Ken Benson & Philip Hagemann. Fonyong Du joined the merriment in a sprightly “Shall We Dance” from Rogers and Hammerstein’s The King and I with Maria Natale and they danced and sang enchantingly. (No ice skating) Mr. Du did one more encore, a thrilling “A te o Cara” from Bellini’s I Puritani with a stunning high D. His voice brilliantly caressing this Bellini Bel Canto masterpiece, infusing it with gorgeous diminuendos and ravishing beauty. Steve De Maio introduced famed Brooklyn born soprano Elaine Malbin and opera manager Ken Benson also from Brooklyn sitting next to Barbara Ann Testa, soprano and judge from the Gerda Lissner Foundation. Cavaliere Edward Jackson poet and scholar, photographer Anita Sanseverino and pianist Alba Mazza both well known to the Brooklyn cultural community were part of a captivated audience. 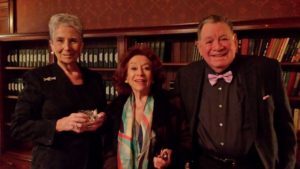 Barbara Ann Testa, Elaine Malbin & Nino Pantano. General Manager John Boden prepared a sumptuous repast of Ravioli pomodoro and basil, Osso Buco with risotto (or Filet of sole) with excellent wines to compliment the evening. A special video presentation was given by educator/lecturer Lou Barrella born and raised in Brooklyn. 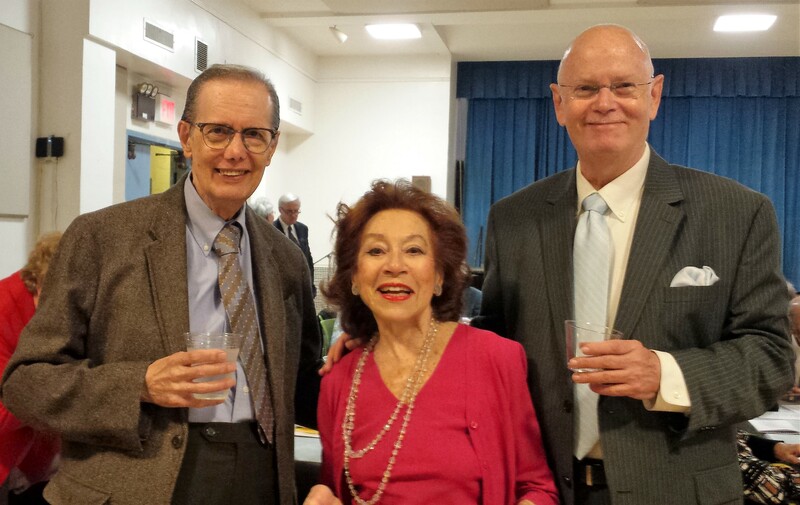 Mr. Barrella gave brief presentations honoring former Met tenor Giulio Gari, famous worldwide Met soprano Elinor Ross and soprano Teresa Apolei. All three (Includng Gloria Gari) are judges for the various opera auditions. Despite a cold, Lou Barrella gave a very well documented tribute. The renowned tenor Giulio Gari (1909-1994) sang at New York City Opera from 1945-1953 and at the Metropolitan Opera from 1953 -1961. His pure powerful tenor and personality made him a favorite of critics and audience alike. His many vocal students adored him. Mr. Barrella showed rare video of Gari singing with soprano Lucia Evangelista in La Traviata. His video of “Celeste Aida” showed a tenor voice radiant and in its prime. Giulio Gari’s widow Gloria and a group from the Giulio Gari Foundation were present for this tribute. Gari was also a beloved vocal coach and the Giulio Gari Foundation headed by his widow Gloria continues his goals to assist young and promising opera singers in their careers. Steve De Maio is Artistic Adviser to the Giulio Gari Foundation. Next was the legendary Elinor Ross, from Tampa, Florida who had both a brilliant career in Europe and in the United States. Her dramatic soprano made her a great Norma, Aida, Leonora, Turandot and Tosca. Clips were shown of Elinor Ross with Mario Del Monaco in Norma. We heard her magical Pace, pace, from La Forza Del Destino and others. When Elinor Ross replaced an indisposed Birgit Nilsson as the Empress in Turandot at the Met, (1970-1979) the ovations were ecstatic! Then in an interview, Ms. Ross told how one morning she woke up with her face half paralyzed from bell’s palsy. Suddenly her career ended. Years later (1996) at a Giulio Gari Gala, she performed again singing a brilliant “Summertime” from Porgy and Bess – a heroic, one time emergence. Ms. Ross, looking radiant, acknowledged the applause with her proud son illustrator designer Ross Lewis looking on. The third honoree was the celebrated lyrico-spinto soprano from New Jersey, Teresa Apolei. Ms. Apolei is an American soprano who returned to our shores after a 15 year career in Italy and Central America in all the major opera houses. Ms. Apolei sang Santuzza (250 performances) in Cavalleria Rusticana and appeared in it with the great Brooklyn born tenor Richard Tucker in Philadelphia and also in Aida to Tucker’s Radames. Ms. Apolei recalled a Tosca so intense that she actually cut through Scarpia’s outfit in the stabbing scene. In Europe, she sang with opera tenor legends Ferruccio Tagliavini, Beniamino Gigli, Mario del Monaco and baritone Gino Bechi. She credited her parents and public school teachers for her illustrious career. Mr. Barrella then presented each honoree, Gloria Gari, Elinor Ross and and Teresa Apolei with a special bouquet to resounding applause. After that, we had desserts consisting of Italian cheesecake, cookies and fruit. It was a joy to chat with the singers and get the pulse of their studies, accomplishments and aspirations. It was nice to see Murray Rosenthal treasurer of Opera Index, composer Philip Hagemann Vice President and Tamie Laurance and Joyce Greenberg from the Giulio Gari Foundation. We thank Steve De Maio, Lou Barrella and Anthony Carrera from The Board of Directors of the Columbus Citizens Foundation and General Manager John Boden and the singers for sharing their prodigious talent. It was an unforgettable evening of food and song. It provided us with the visceral thrill of hearing and seeing these talented performers on the cusp of a very bright future! 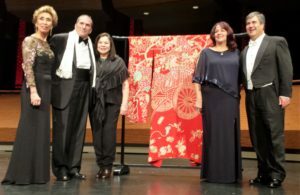 Denise Goben & tenor Ricardo Tamura. 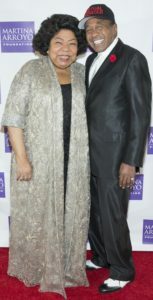 On the afternoon of Sunday, October 23rd, The Licia Albanese-Puccini Foundation celebrated its 42nd anniversary with a concert at Rose Hall in the Time Warner Building and presented its awardees.This annual event is looked forward to with great anticipation by opera lovers and has grown into a “must be there” event. The legendary soprano Licia Albanese (1909-2014) gave it life and led the “Star Spangled Banner” until her 104th year. Nino Pantano, Stephen De Maio & Eva De La O. 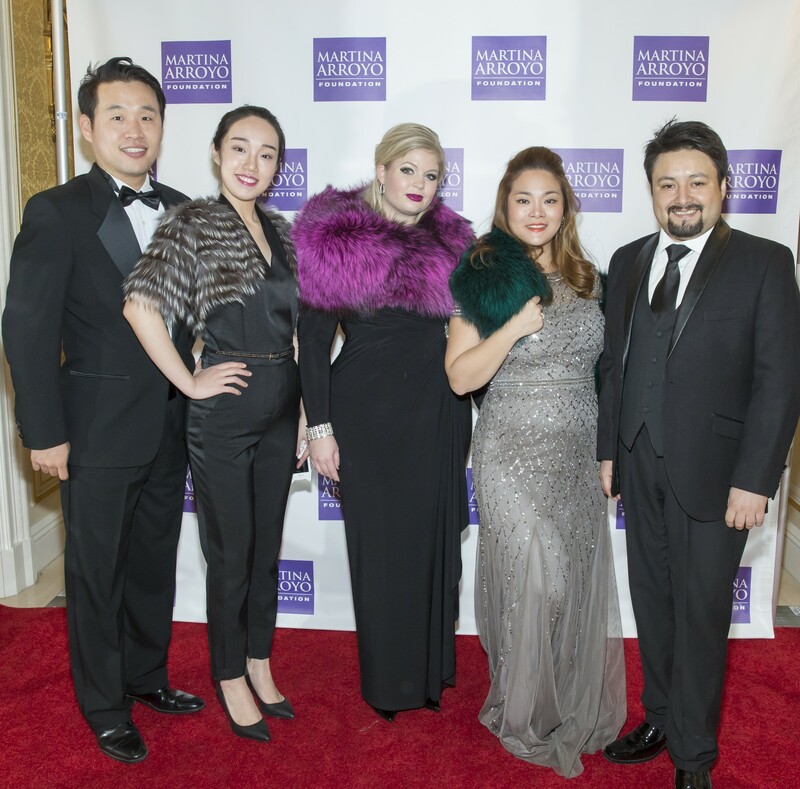 Past winners who have achieved success at the Metropolitan Opera (Met) and world stages were presented with distinguished achievement awards. First was to acclaimed tenor Bryan Hymel, who spoke of Licia Albanese’s impact on his career, soprano Ailyn Perez who sang a haunting “Lumille Ancella” from Adriana Lecouvreur, soprano Nadine Sierra who captivated us with an ethereal and enchanting “O Mio Babbino Caro” from Puccini’s Gianni Schicchi and Mariana Zvetkova who thrilled us with “Keim liche Aufforderung” by Richard Strauss.The lifetime achievement award was presented to soprano Lauren Flanigan whose roles with the New York City Opera (NYCO) and the Met were riveting. Ms. Flanigan enthralled us with a bloodcurdling “La luce langue” from Verdi’s Macbeth! Soprano Lauren Flanigan, Brian Kellow. Met tenor Ricardo Tamura who flew in from Germany for this occasion with his charming wife Dagmar, told the audience how Licia Albanese heard him sing when he was ready for a career as a scientist. She encouraged him to go all out for a singing career instead. Despite a cold, he had to attend this special event to honor Licia Albanese. Tamura then sang a brilliant “E lucevan le stelle” from Puccini’s Tosca with sublime fortissimos and breathtaking diminuendos and received an ovation. Our special host for the gala was the erudite Brian Kellow, who wrote a beautiful obituary for soprano Patrice Munsel in the November issue of Opera News. Ms. Munsel preceded Brian as the lively host for the Albanese-Puccini galas. With the pianistic wizardry of Arlene Shrut and Jonathan Kelly accompanying the singers, the program began. Kidon Choi used his mellifluous baritone in “O, Mariya, Mariya” from Tchaikovsky’s Mazeppa. His vibrant, resonant baritone captured the Russian melancholy to the core, from beautiful top to burnished bottom. Maria Natale’s soaring and lovely soprano and Alexander McKissick’s sturdy tenor transformed us to that garret in Paris in “O soave fanciulla” from Puccini’s La Boheme with soprano sparkle and tenorial triumph. Their final high notes took us “into the rare” on a stairway to paradise. Ah! young love! Mozart’s Don Giovanni was next with the duet “La ci darem la mano” sung by Mia Pafumi and Pawel Konik. Ms. Pafumi’s caressing soprano and Mr. Konik’s beguiling basso made for a saucy and savory blend. “Eri tu” from Verdi’s Un ballo in maschera was sung with smooth legato and strong pathos by baritone Norman Garrett. His finale was ardent and touching and in the Verdi baritone manner. “Je crois entendre encore” from Bizet’s The Pearl Fishers was splendidly sung by Fanyong Du whose dulcet penetrating tenor evoked the style of Nicolai Gedda. Enrico Caruso’s haunting version of this aria was used on the sound track for Woody Allen’s film Match Point. More exotic fare followed with the popular duet “Sous le dome epais” from Delibe’s Lakme. Soprano Amber Daniel and mezzo Samantha Hankey blended as one, their voices rising and falling and fading from the ear as if produced by a golden harp. 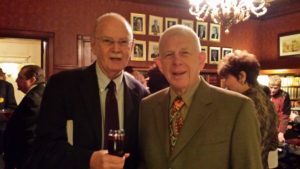 Dr. Robert Campbell & Lewis B. Cullen. Jared Bybee sing an old favorite, “Vision Fugitive” from Herodiade by Massenet. Mr. Bybee has a rich expansive baritone, perfect for this aria, which I recall sung by Igor Gorin from the Voice of Firestone many years ago. Mr. Bybee sang beautifully making me relive some lovely memories! Tracy Cantin used her clear, powerful and sumptuous soprano in “Che il bel sogno di Doretta” from Puccini’s Le Rondine. This role suits her voice like a velvet glove! Cantin and Puccini are a perfect fit! 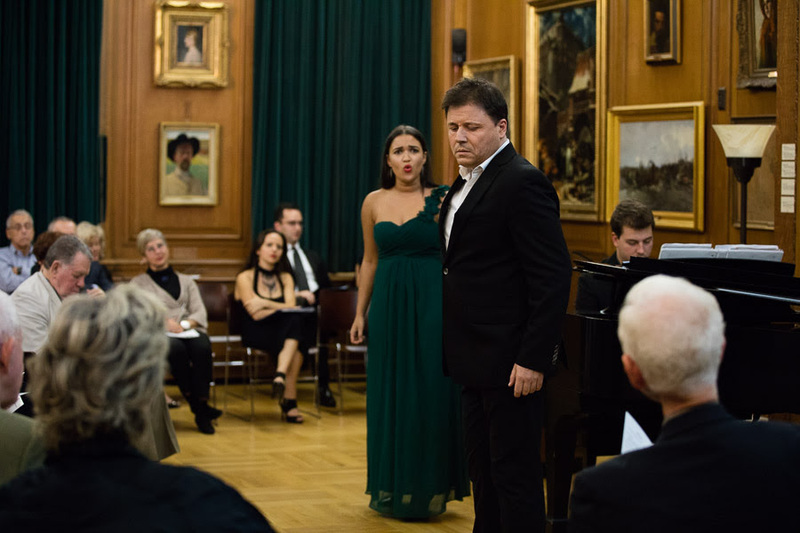 Australian tenor Alasdair Kent captivated us with “Fantaisie aux divins mensonges” from Lakme. His technique is as natural as that of a songbird, rhapsodic and superb with a sudden pianissimo ascent to a high C at the finale. It made me think of the great tenor John McCormack. Andre Courville sang “Air du tambour major” from Le Cid by Thomas.This popular aria whose recordings by Pol Plancon and Ezio Pinza merit re-listening was brilliantly sung. Mr. Courville captured the bravado, swagger and braggadocio of the foot stomping piece, coupled with scales, ascents and descents. Courville made the adrenaline flow! First prizewinner Karen Barraza sang “Tu che di gel sei cinta” from Puccini’s Turandot. The death of Liu was the last music Puccini wrote before he himself passed away. Ms. Barraza’s soaring soprano was even and powerful, yet tapered and delicate. She achieved the essence of the poignant pleas of the slave girl who dies for her master. The top awardee, Vanessa Vasquez concluded the concert with “Un bel di” from Puccini’s Madama Butterfly. Ms. Vasquez used her lyric soprano with balance and inner focusing as if we were reading her thoughts. Ms. Vasquez generous and ample soprano enveloped the audience. All these young and gifted singers sang from the heart and made every word matter, following the sage advice from the great Licia Albanese. We are all the recipients of her legacy! Several hundred of the audience walked over to the New York Athletic Club a block away to attend the glittering star studded dinner and celebration. 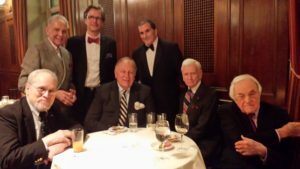 We sat at the table of Stephen De Maio, who also serves as President of the generous Gerda Lissner Foundation. While “table hopping” we were happy to greet Cornelia “Conny” Beigel, Secretary of the Gerda Lissner Foundation, Joseph and Maria Gimma, son and daughter-in-law of Licia Albanese and Father John Kamas from St. Jean Baptiste Church who gave the benediction. 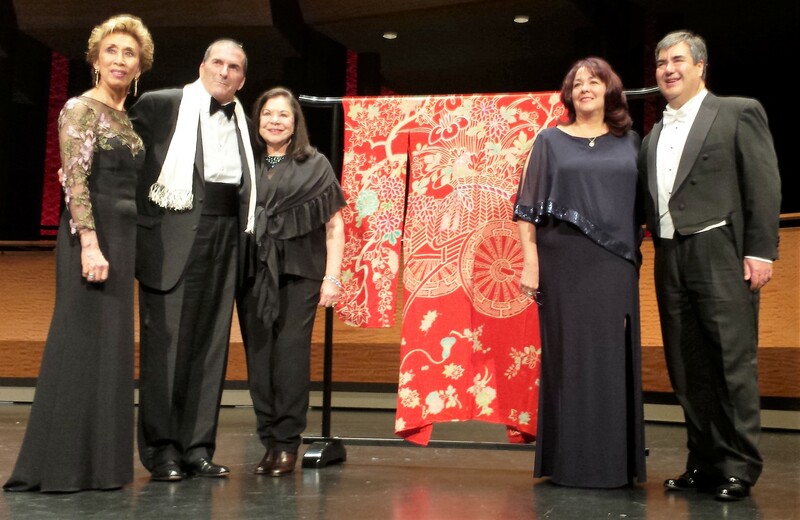 A “quartet” of legendary opera legends such as Diana Soviero, Elinor Ross, Martina Arroyo and Rosalind Elias, along with Maestro Eve Queler and patron Karl Michaelis, Michael Fornabaio, treasurer of the Puccini-Albanese Foundation and patron presenter Joyce Greenberg with the dapper Ralph Petrarca enjoyed the festivities. Other organizations included were Opera Index’s President Jane Shaulis (Met mezzo) Vice President Janet Stovin, (Brooklynite), Treasurer Murray Rosenthal, Executive Director Joseph Gasperec, Gloria Gari from the Giulio Gari Foundation, Glenn Morton, Artistic Director from Classic Lyric Arts, Eva De La O, Executive Director from Musica De Camara all lent their vibrant presence, as did ever effervescent writers Scott Barnes and Meche Kroop, while poet/Italian teacher Cavaliere Edward Jackson lent us his joie de vivre! It was a pleasure to greet Alfred and Christine Palladino who are benefactors and patrons. Christine shares the joys with my wife Judy of having gone to Lincoln High School in Brooklyn. Among the guests were Angelo Vivolo, President of the Columbus Citizens Foundation, Gregorij von Leitis and Michael Lahr from Elysium “Between Two Continents” both literary and humanitarian endeavors, patrons Cesare Santeramo and Dr. Robert Campbell, jeweler Mark Bunda, from the Sachi Liebergesell family, presenter Betty Cooper Wallerstein, Marjan Kiepura and vivacious wife Jane, son of esteemed Met tenor and film star Jan Kiepura and the unforgettable soubrette soprano Marta Eggerth who to many were Danilo and Hanna for their countless appearances world wide in The Merry Widow. 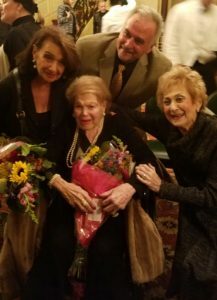 Marta Eggerth (1912-2013) sang at the Albanese Gala until she was well into her 90’s and lived to the age of 101. Marjan Kiepura is also a virtuoso pianist and Chopin expert thus continuing the family tradition. Hope is the songbird in our heart that keeps on singing! 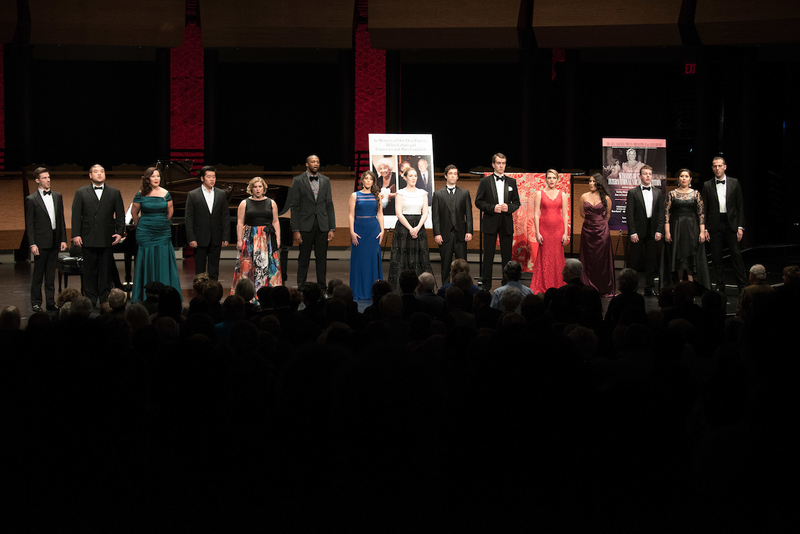 A toast to President Sachi Liebergesell and congratulations to the 2016 international vocal competition winners.